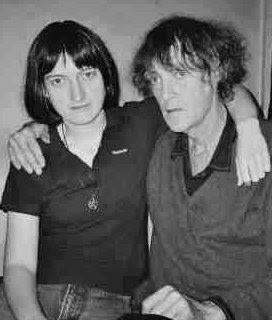 Catherine Fearnley with David Farrant in 2004. Catherine Fearnley has described her ex-boyfriend as a Satanist, liar and deceiver. We would describe him as a paranoid attention-seeker who has dabbled superficially with the black arts in his pursuit of media publicity to which he is clearly addicted. We would, therefore, regard him as a pseudo-occultist who probably believes in none of it. Miss Fearnley was with this man from June 2004 to June 2007. By her own admission, during that period, she assisted in her boyfriend’s malicious vendetta against Bishop Manchester and any third party thought to be connected to the bishop. In July 2007, she approached Bishop Manchester by email to apologise for her behaviour in the previous three years and to seek some sort of reconciliation. He accepted her apology and occasionally gave his advice when she sought it. This was chiefly to recommend that she move forward, ignore everything to do with the man whom she had helped cause grief for the bishop, and put the past behind her. Her own priest (she converted to Roman Catholicism in 2007, having previously been a witch who espoused paganism) gave her precisely the same advice by recommending she no longer commented about her ex-boyfriend or anyone else connected to the time she was immersed in witchcraft and the occult. Did she heed this advice? This week she has been busy sending her ex-boyfriend, David Farrant, private messages and even holding a discussion with him on a forum where supernatural and occult topics are the main theme. 1. How did you first become interested in the Highgate Vampire Case? 2. You previously served as a moderator on The Cross And The Stake. How did you obtain this post? Technically this is not correct Anthony, not only was I the moderator, I was also the creator of this group, I started this group because I had an interest in the case anyway and I was aquainted with Bishop Manchester at the time. I also noticed that they did not have any discussion groups. I was advised by Bishop Manchester not to post up any of my own thoughts on here and to let the members ‘sort themselves out’ to this end I did only posting up general responses which Bishop Manchester gave to me at the time. I was also advised not let it be known that it was Bishop Manchester himself who was making posts on various message boards in response to David Farrant, the email read “it’s absolutely imperative that nobody knows that it’s me who is making these posts” at the time I gave David Farrant a copy of this email but do not have a copy of it myself so now it would be my word against theirs. But unlike some people I have no reason to lie about things or make things up as I go along. By “acquainted” Miss Fearnley, who has never met Bishop Manchester, means she was acquainted with him on the internet, as are thousands of others. Miss Fearnley did briefly moderate, along with three others, a group. This was one of a myriad of such groups attracting positive interest in Bishop Manchester. Miss Fearnley contributed next to nothing herself and clearly had difficulty in answering members’ queries because she did not have sufficient knowledge of the subject matter, plus some of it was personal to the bishop and could only be dealt with by him. It is certainly not true that the bishop responded to Mr Farrant under any guise on this or any other forum. There is no email such as she refers to because Bishop Manchester does not respond to Mr Farrant as a matter of policy. He merely provided information to Miss Fearnley to be included in replies to difficult questions about demonolatry she was otherwise incapable of commenting on. Mr Farrant was a topic discouraged by the forum administration and it was Anthony Hogg’s insistance on discussing this man which led to his expulsion. This coincided with Mr Hogg’s own forum coming into existence where Mr Farrant was the main topic of conversation. Attacks on Bishop Manchester started to appear and steadily increased until they reached an alarming level where today Mr Hogg is regarded as a stalker who harasses the bishop on an almost daily basis. 3. You were eventually expelled from the post. What reasons, were you given? Again, I was not expelled as such, I left of my own accord basically because I became involved with Farrant at the time. I was told it either had to be one side or the other I could not be party to both, so I went with Farrant, then Bishop Manchester and his group then started being hostile with me for no reason other then I had become involved with Farrant, it got so bad that I had started to take out an injunction against Bishop Manchester but had to drop this due to personal reasons. Miss Fearnley was not expelled as a forum moderator. Unknown to the administration, she had been communicating privately with Mr Farrant and decided of her volition to end her modest activity on the forum and her association with the bishop. She was not told anything by Bishop Manchester, so it must have been Mr Farrant who gave her an ultimatum. Hostility arose because Miss Fearnley assisted Mr Farrant in his hate campaign against Bishop Manchester. No injunction was ever filed against the bishop. In a letter to the bishop, dated 9 August 2009, Miss Fearnley states: “Farrant pestered me so much to do this and I had got everything in motion. … I am quite prepared to let bygones be bygones on this and put the past behind us completely, well and truly, and move on.” Bishop Manchester was obliged to register complaints against Mr Farrant, Miss Fearnley and Mrs Green with the police. Mr Farrant was arrested under the Protection from Harassment Act, but the CPS did not allow the case to proceed due to the police bungling the charge by using a paragraph of the Act unlikely to succeed which carried a jail term. Had they gone for another charge where no custodial sentence was involved the CPS would have almost certainly allowed Mr Farrant to be prosecuted and the Crown would have won without any difficulty. 4. Soon enough you became Secretary of the British Psychic and Occult Society, and the Highgate Vampire Society. How did you rise to this position? What tasks did you carry out? Well as I’ve previously stated I became involved with Farrant, he didn’t have the use of a computer then as such only a word processor so it was easier for me to do the typing and organise membership cards, newsletters, etc and so forth. Also in and among Farrant asked me to make posts against Bishop Manchester which were of a derogatory nature so he wouldn’t have to put his name to them, all of this I now deeply regret no end. In fact I regret ever getting involved with them in the first place full stop. Miss Fearnley was only ever “involved” with Mr Farrant. She had no involvement with the bishop outside of infrequent internet contact, as do many other people who do not regard themselves as “involved” with the bishop. Miss Fearnley was Mr Farrant’s girlfriend for three years and should know something about him. Today she regards his claims of encountering a “psychic entity” forty years ago to be a hoax. The “British Psychic and Occult Society” exists in name only. It was created by Mr Farrant in 1983. He lists people who purchase his self-published pamphlets as members of the “BPOS.” Nobody has ever met any member beyond John Russell Pope, a self-proclaimed Satanist, who Mr Farrant appointed “head of the junior department of the Highgate Vampire Society,” another society invented by Mr Farrant in 1997. Mr Pope has a criminal conviction for sexual assault on a young boy. Mr Farrant sent voodoo death dolls to the witnesses in Mr Pope’s case, and received a two years jail sentence himself for doing so. The only newsletter to have existed was edited by an anarchist supporter of Class War, living in London’s East End, who no longer wants anything to do with Mr Farrant and his malicous vendetta against the bishop. It was an open secret that Miss Fearnley did Mr Farrant’s dirty work from 2004 to 2007; something she today does not attempt to hide or deny. 5. You were eventually expelled from this role too, how did this come about? Basicallly because David Farrant got it into his head that I was heavily involved with Bishop Manchester again, also our personal relationship had deteriorated because I had changed my religion and faith for personal reasons which I won’t go into, plus another 101 reasons which all added up to one huge massive argument and Farrant and I went our own separate ways, I want to make this absolutely clear from the start that I am NOT involved with either party anymore, nor do I wish to be. I have my own life now and it is far removed from what I had back then. I’ve met nice people, made new friends, hopefully got myself a new partner, and have moved on. Pity others cannot do the same. Miss Fearnley has never been “involved” with Bishop Manchester. Over the last three years, however, she has sent him messages, asking his advice, and has applied to join various groups administrated by him or his colleagues. She was even a member of FoBSM on Facebook. If, as she says, she has her own life now, why would she want to be publishing material on the internet that opens up old wounds and offends all concerned. She has obviously not “moved on.” If she had she would be providing Mr Hogg with ammunition to use to the detriment of Bishop Manchester whom he attacks on a regular basis. Nor would she be discussing Mr Farrant again on the internet against all the advice she has received from her priest and Bishop Manchester. 6. You’ve had exclusive behind-the scenes view of the opposing parties of the Highgate Case, what have your experiences taught you about them? Not to get involved with either party. I think that the whole Highgate nonsense came about through a hoax on both sides, both parties are as bad as each other as far as internet wars are concerned. They both use the Highgate case to make money, throw insults at each other especially family, friends, relatives, they both want to hurt and threaten all involved as much as they possibly can, it doesn’t matter to either/or if innocent people are involved with all of this. And to be honest it’s all so completely sad that this matter has been allowed to drag on 30/40 yrs down the line when both men are in their 60’s/70’s and should know better. Those who have researched these matters would be aware that Mr Farrant’s part in early 1970 was undoubtedly a pathetic hoax aided by his landlord, Tony Hill, whose coal bunker Mr Farrant was residing in from August 1969 to August 1970, after being made destitute following eviction and bankrupcy in 1969. A couple of Mr Farrant’s acquaintances also conspired in the ghost story hoax which Mr Farrant abandoned when it became clear something genuinely demonic was abroad at Highgate Cemetery. This provided a publicity bandwagon for Mr Farrant which he still apears to be exploiting. Bishop Manchester’s bestselling The Highgate Vampire states on the reverse of the title page that all proceeds from the book are donated to the church. He has also donated appearance fees to the church. The only person to insult family, friends and relatives is Mr Farrant who sends his malicious mail to anyone thought to be connected to Bishop Manchester. Some of those to receive Mr Farrant’s unsolicited pamphlets containing libellous material and stolen images have filed complaints with the police. The reason the situation has dragged on for forty years is because Mr Farrant, who has been living on social security benefits all this time, feeds off it. He does not give an interview without making personal attacks on Bishop Manchester who has not once mentioned Mr Farrant in an interview since his first television appearance on 13 March 1970. 7. Do you believe any supernatural phenomena took place at Highate? If so what form did it take? No I don’t believe that any kind of supernatural phenomena took place at Highgate, I think it was all mass hysteria at the time made no better by the public press making reports and then some crazy person organising a alleged ‘vampire hunt’ people making claims that they staked the ‘vampire’ and such forth. Where is the evidence? There is none , save from the two people who created this ‘legend’. It should be pointed out that Miss Fearnley was not born until 1973. The mass hysteria took place in early 1970. When asked about the “crazy person organising a vampire hunt,” she told us that she had actually meant Alan Blood. So why didn’t she say Alan Blood instead of “some crazy person”? Mr Blood, of course, did not organise a vampire hunt and kept well away from Highgate Cemetery on the night in question. He certainly made no claim to having staked the vampire. So, once again, the back-peddling by Miss Fearnley appears to be disingenuous. There is overwhelming evidence to support the case, which is why it has attracted so much attention. First-hand witnesses and even those who fell victim have appeared in television interviews and documentary films, eg True Horror: Vampires (Discovery Channel) which is available on DVD. There is also an archive of photographic and other documented evidence held by the research society founded over forty years ago by Bishop Manchester. 8. In light of your experiences, what advice would you give to other researches interested in the Case. Don’t get personally involved with either party you will come to regret that you ever did. Keep your findings to yourself, don’t get involved in any message boards as you will become embroiled in a hate campaign. You will receive death threats, have your email accounts hacked into, have personal information found about you and such forth. I was once told by a member of Bishop Manchester’s group at the time that they even knew my National Insurance number and the very job centre that I used to visit at the time. The other party is just as bad for obtaining personal addresses and posting these in public so all can see also they publish private and personal correspondence to all and sundry and in booklet form, make ridicule of your religious believes if you have them and both make untrue stories about you. So take my advice and keep well clear of the lot of them. I hope that my responses give a little insight into how I became involved and very much later regretted being involved into the case, I hope that now this interview has gone online it will be the last of the matter but I very much doubt it, it will probably stir things even more but I can choose which comments will go online and what won’t, so be forewarned. Nobody known to Bishop Manchester has claimed to have Miss Fearnley’s National Insurance number. How would that be possible? Nobody sympathetic to Bishop Manchester has ever met Miss Fearnley who, incidentally, has informed the bishop during the last three years of address changes and the fact that, like Mr Farrant, she is on the dole. Miss Fearnley has hardly taken her own advice when she says “keep clear of the lot of them.” She has been busy communicating with Bishop Manchester who has only ever repeated the same advice to her, which is to ignore Mr Farrant and get on with her life. She naively feels that publishing libellous allegations about the bishop will “be the last of the matter” when “the last of the matter” could have remained where it was three years ago. Now she has opened a fresh can of worms and is right back where she began.